Arriving at San Francisco 24 August 1953, the attack transport engaged in coastal training operations for the next year. She sailed for another tour in the Far East 24 October 1954, and participated in an amphibious training exercise in December. As war over the Tachen Islands threatened in February, HENRICO and other naval units moved in 8 February 1955 to evacuate Nationalist Chinese troops. After arriving at Keelung, Formosa, 13 February, she carried troops between the Philippines and Hong Kong before returning to San Diego 22 April 1955. Hereafter the ship deployed annually to the western Pacific with the 7th Fleet to engage in amphibious warfare training exercises in Korea, in Okinawa, and in the Philippines, contributing to the combat readiness of both United States Marines and the troops of SEATO members. HENRICO was diverted to the Caribbean Sea 27 October 1962 after deployment of communist missiles in Cuba brought a swift and strict American quarantine of the island. HENRICO arrived on the scene 5 November. Her embarked Marines provided part of a ready force to supplement the naval blockade if this proved necessary. When the missiles were removed, the crisis subsided, and HENRICO departed the Caribbean 6 December for San Diego, arriving 15 December 1962. 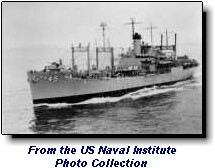 The ship resumed amphibious training duties on the West Coast until 16 December 1964, when she deployed again with the 7th Fleet in the western Pacific. Loading a Marine Battalion Landing Team at Okinawa, the ship departed 11 January 1965 for Hong Kong, arriving 14 January. On 20 January she commenced special operations in the South China Sea as the 7th Fleet joined in the intensive buildup of strength in Southeast Asia.